Mix the cream cheese with the sprig onions, rosemary, thyme, lemon juice and paprika. Season with salt and pepper. Heat a griddle pan until very hot. 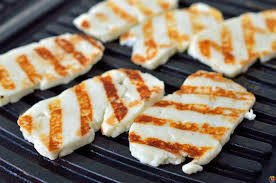 Brush the bread, halloumi and mushrooms with oil then grill for three minutes on each side. Serve the mushrooms and halloumi on the toast with the cream cheese, and paprika. Garnish with thyme leaves.